Macau’s casinos are on their first official city-wide shutdown order as Typhoon Mangkhut bears down on the special administrative region of China. Earlier this week, as the so-called ‘super typhoon’ began tracking a path towards southern China, Macau’s Gaming Inspection and Coordination Bureau met to determine whether or not it had the authority to order the temporary closure of all casinos, given the expectation that Mangkhut’s fury could threaten local lives. Apparently, that answer was ‘yes,’ as Macau’s Civil Protection Operations Center issued an order on Saturday that calls for all casinos to “suspend all gambling activities” effective 11pm. The government further advised all casino operators to implement the agreed upon typhoon contingency plan to protect both casino staff and guests. Earlier Saturday, the government announced that it had granted requests from four small SJM Holdings-licensed casinos to suspend their operations as Mangkhut drew closer. All border crossings with mainland China will close at 1am and ferry services have been suspended. 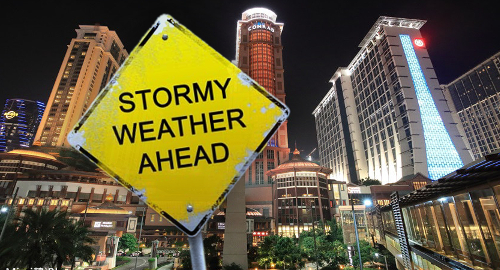 Macau’s Meteorological and Geophysical Bureau (SMG) was scheduled to raise its official Typhoon Signal to level eight early Sunday morning, and that signal could be raised to its maximum level (10) depending on the storm’s expected fury when it makes land. The SMG apparently isn’t taking any chances this time around, after coming under fierce criticism in 2017 when it was suspected of delaying the raising of the warning signal as Typhoon Hato drew closer. Macau labor laws require businesses to pay their staff overtime when the signal reaches eight or higher. Hato brought a serious storm surge that flooded several casinos and caused the deaths of 10 local residents. Hato also resulted in a reduction in tourist traffic to Macau and blunted that month’s casino gaming revenue growth. Presumably, Mangkhut will have a similar impact on September’s gaming revenue.